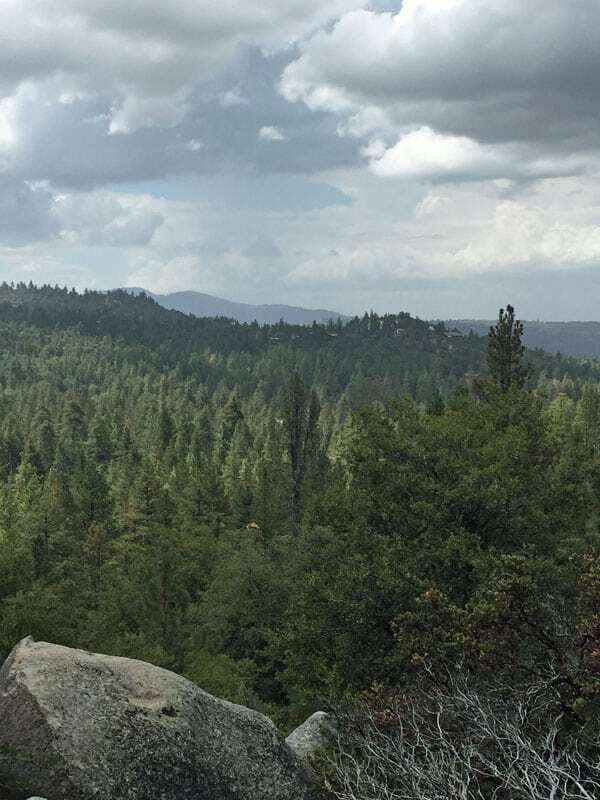 We’re going a little off topic today to share some pics from our trip in July to Idyllwild, California. This wasn’t a sponsored trip, just a personal vacation. 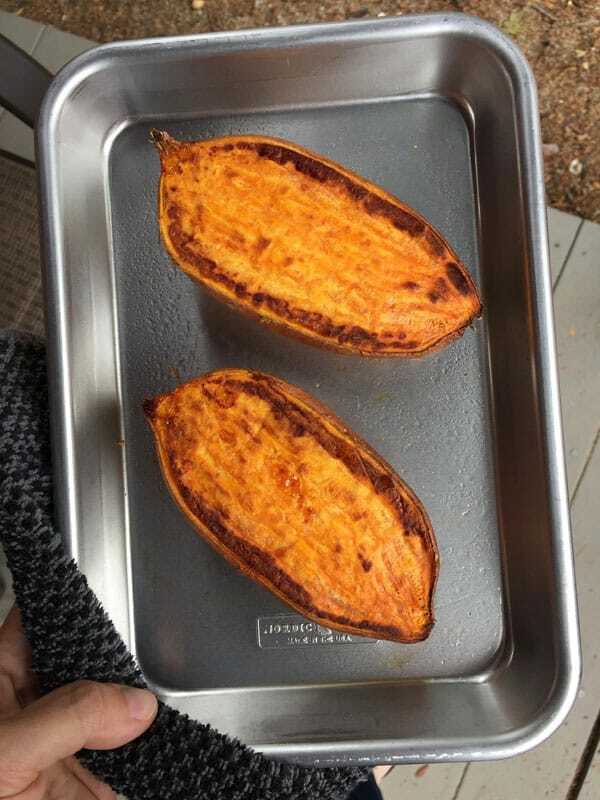 Initially, we only planned to write about the food we cooked. 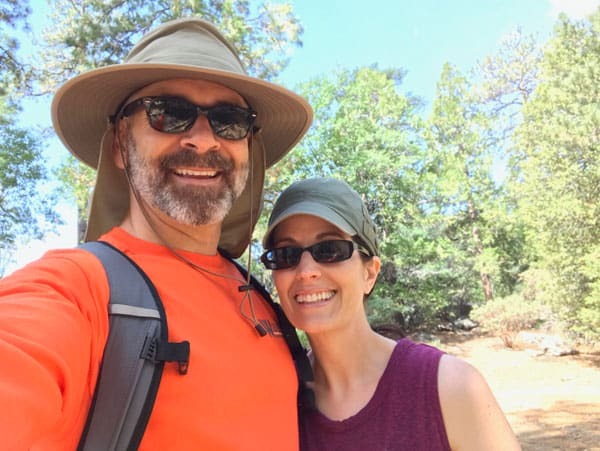 But my heart sank recently when Idyllwild’s local community was affected by the Cranston Fire. So we wanted to share what a special place it is and hopefully encourage others to visit. Warning: there are a lot of photos! If you want to skip ahead to the food, please scroll to the middle of the post. 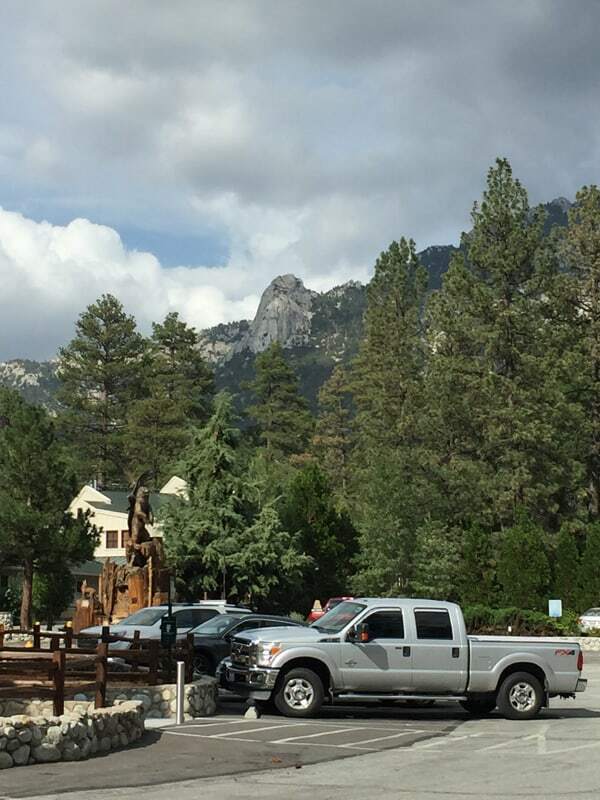 Idyllwild is a charming little town located in the San Jacinto Mountains about 2 hours outside of Los Angeles. 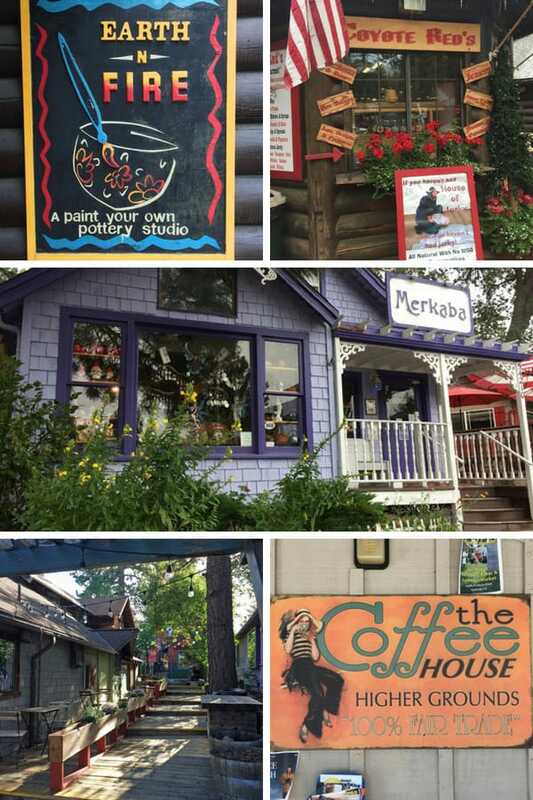 It’s big on ‘small town’ feel, with locally owned shops and not a Starbucks in sight. 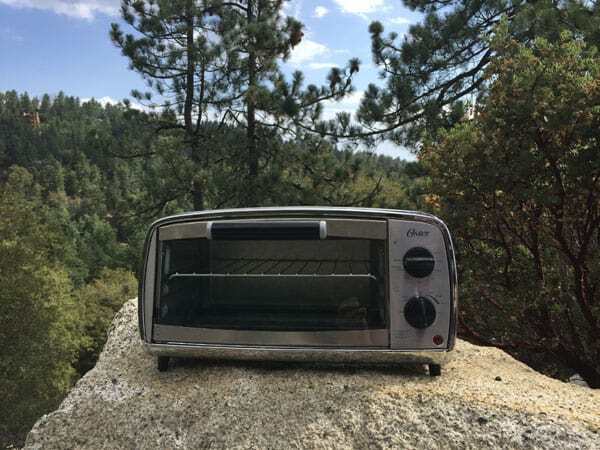 If you want to get away from the city, go hiking, indulge in delicious baked goods, and just enjoy the peaceful beauty of the mountains it’s the perfect place to visit. 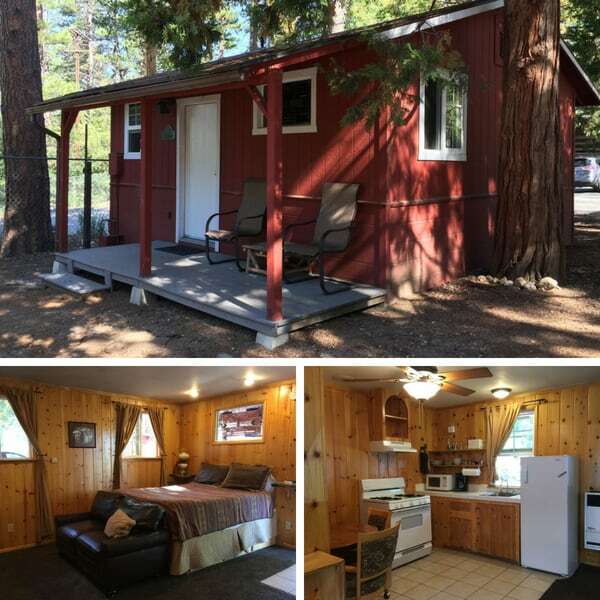 There are a lot of small inns, lodges and private cabins to choose from. I wanted to stay close to the center of town and Tim’s only request was for an unattached cabin. 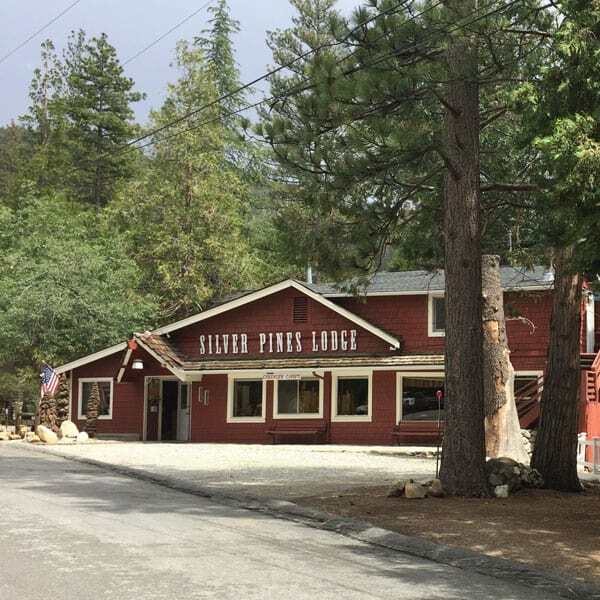 We settled on a cute little studio-style cabin located at Silver Pines Lodge. The staff at the lodge were very helpful and friendly. As were their dogs who will happily greet you (and ask for belly rubs) anytime you stop by the front office. Our cabin was small but had plenty of room for two people and included a kitchen with dishes, pans, and anything else you’d need to cook a meal. Though I think we spent more time hanging out on the awesome porch than inside the cabin itself. 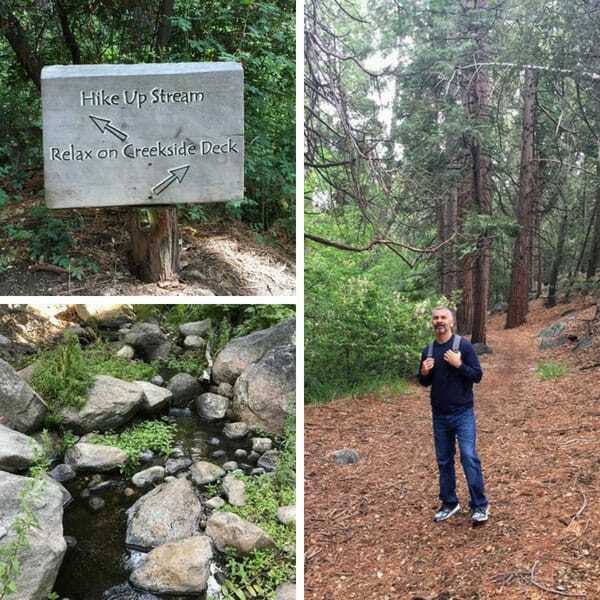 A huge perk I hadn’t noticed when I booked the place was the access behind the lodge to a beautiful trail along Strawberry Creek. 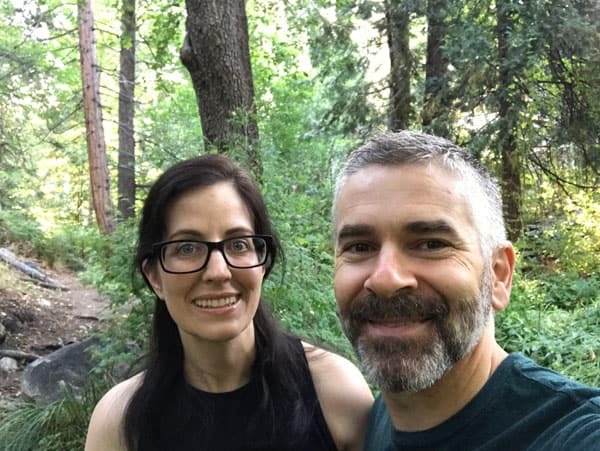 We spent a lot of time walking along the creek and admiring the lush surroundings. For our next visit, we’re feeling a bit brave and thinking about camping! 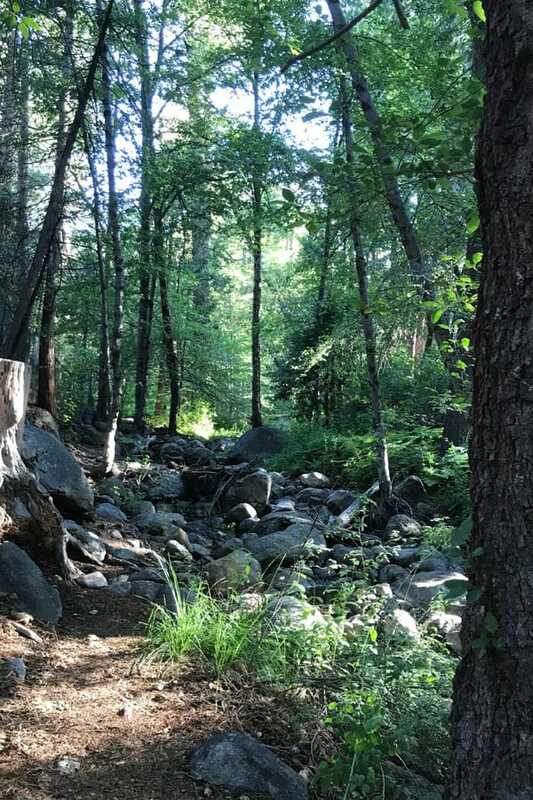 There are a bunch of neat campground options in and around Idyllwild, including a place called Lake Hemet. 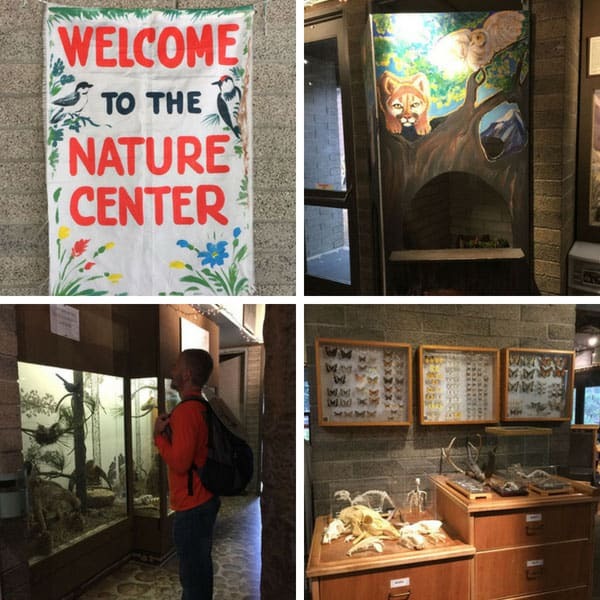 The Idyllwild Nature Center & Park was one of our favorite adventures. We started in the museum area which I’m sure is a big hit with little kids. They have a cute puppet theater, live animals (you’ll have to ask Tim about those, I just can’t with snakes, especially right before a hike!) and lots of information about the local history and native culture. The park staff is super friendly. They helped us pick out a trail for our skill level (which I’d describe as moderate at best) and made sure we had a map so we wouldn’t get lost. The hike was about 3.5 miles long and not so tough that we’d need hiking boots. 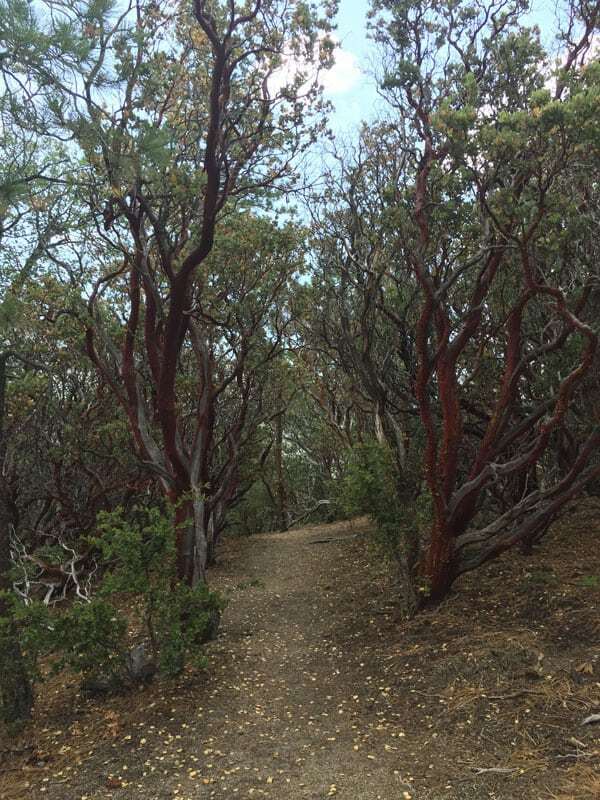 It varied from deeply wooded areas to rocky terrain and at one point we passed an open meadow. The mountain views and beautiful forest surrounding were fantastic. 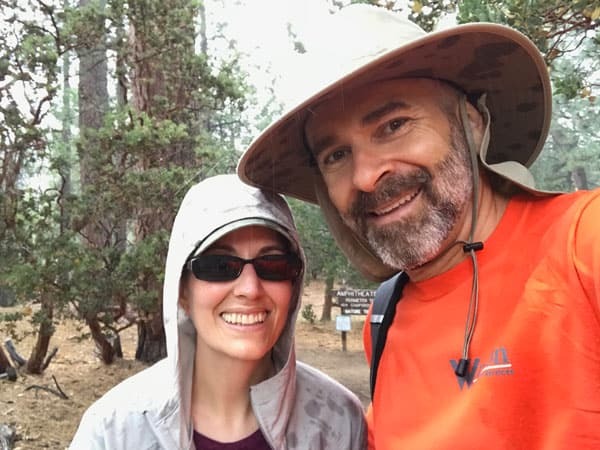 Fortunately for us, we timed the hike fairly well and were just snapping a “Yay, we finished!” pic when the clouds that had rolled in burst open and poured down buckets of water. In the short walk/run to the truck, we got soaked! If staying dry, sipping wine, and admiring art is more your thing, no worries. There are plenty of art galleries, lounges, and pubs with nightly live music. 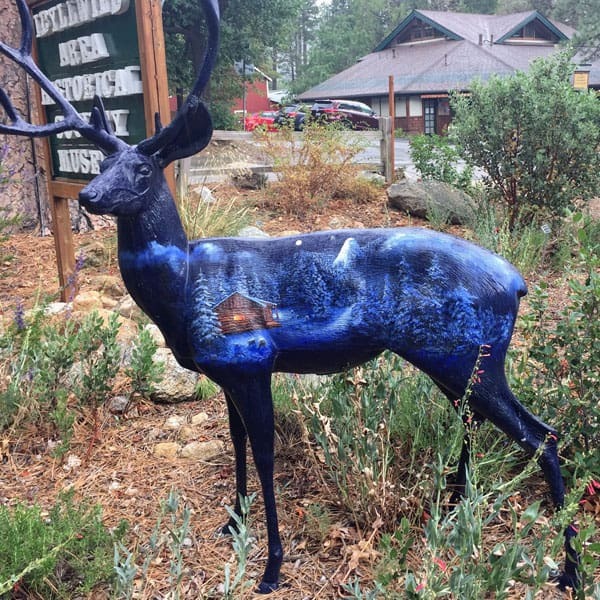 Idyllwild Arts Academy also has a Jazz In The Pines summer event that features three days of talented jazz musicians. 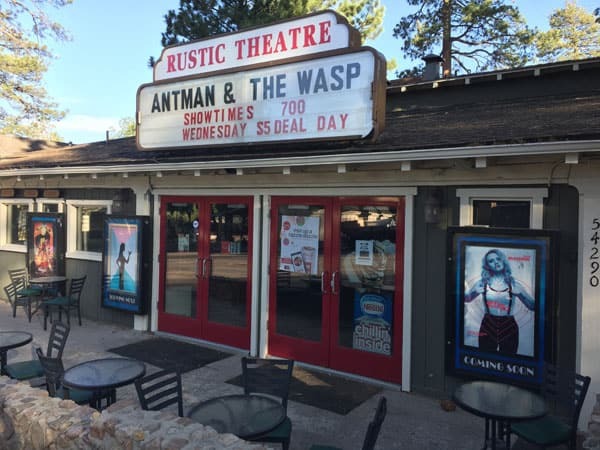 The town’s movie theatre called The Rustic Theatre has one showing a day at 7:00 P.M. We happened to be visiting on a Wednesday and got to take advantage of their $5.00 deal to see Ant Man & The Wasp. It was a full house, lots of fun and the freshly popped popcorn was crazy delicious! 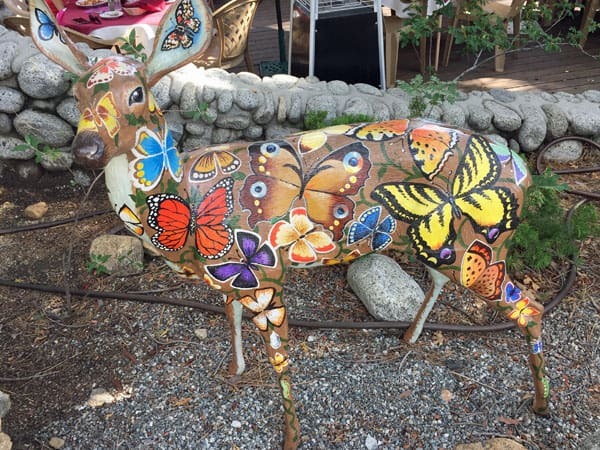 Throughout the town, you’ll stumble across ornate deer sculptures painted by local artists. There are even maps available for the locations of the different ‘deer sightings’ so you can see them all. I don’t know about you but for us, a big part of the fun of visiting a new place is sampling their local bakeries and restaurants. 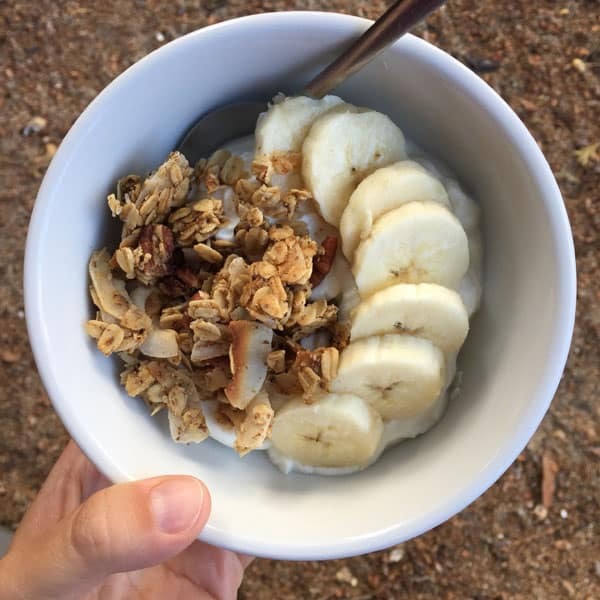 In the past, we’ve usually overindulged and felt kind of awful afterward. This time we wanted to balance out all the party food with some real food too. 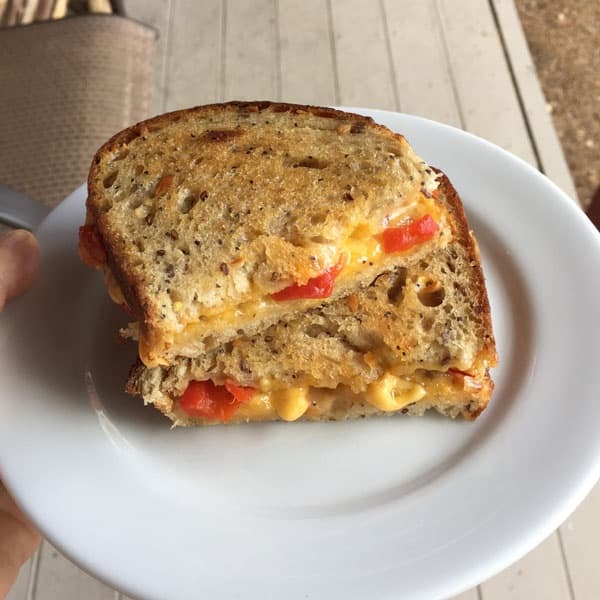 So before heading out, I packed up snacks, veggies, canned goods, and our little toaster oven (don’t leave home without one!). 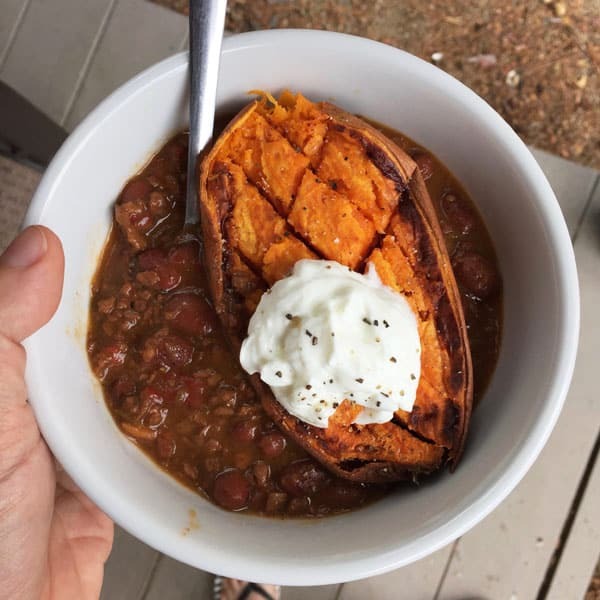 We did eat out a few times but ended up making most of our meals in the cabin. 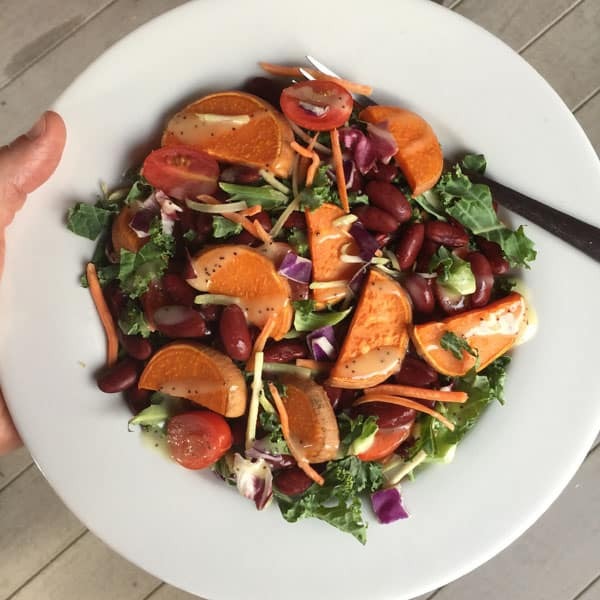 Meals like fancied-up bagged chopped salads with roasted sweet potato rounds, kidney beans, and hard-boiled eggs. 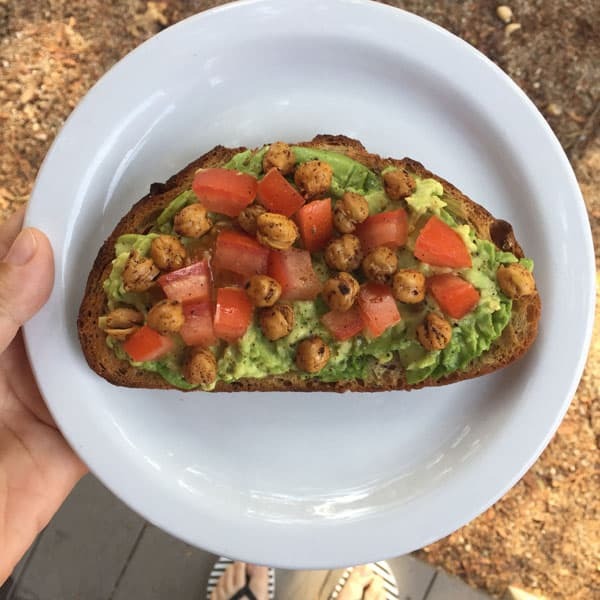 While we did snack on these toaster oven roasted chickpeas by the handful they also made appearances on avocado toasts and in salads. 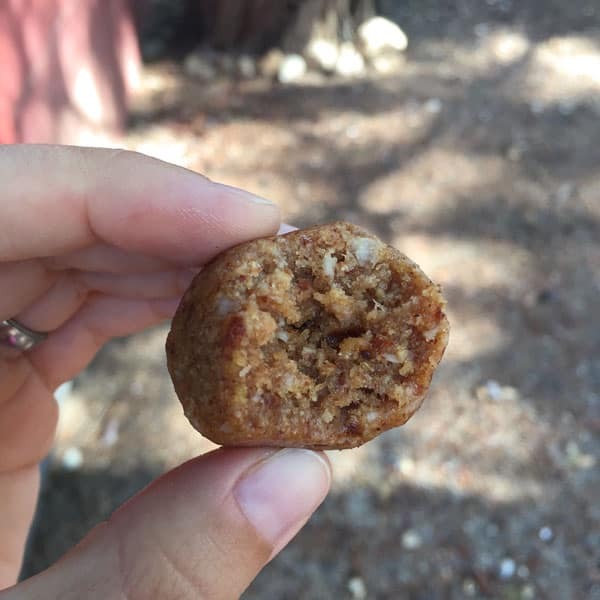 For a quick snack, I brought along lemon protein bites made with dates, coconut, almond butter, lemon, and vanilla protein powder. 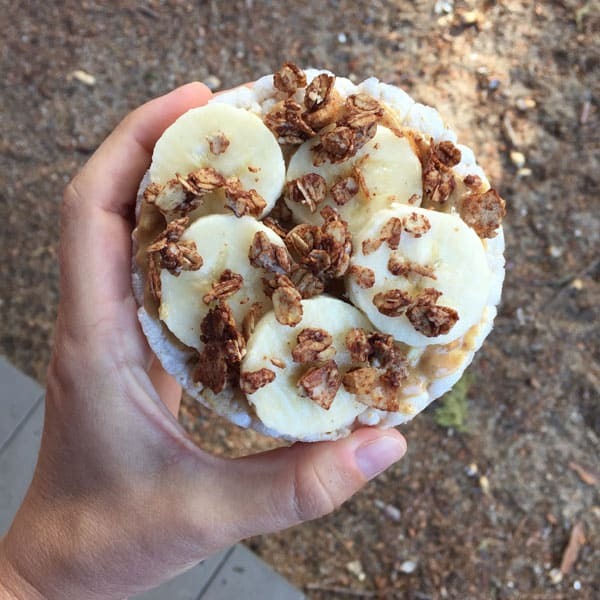 Breakfasts usually involved clumpy maple pecan granola or chocolate coconut granola paired with peanut butter slathered rice cakes or bowls of Greek yogurt with banana slices. 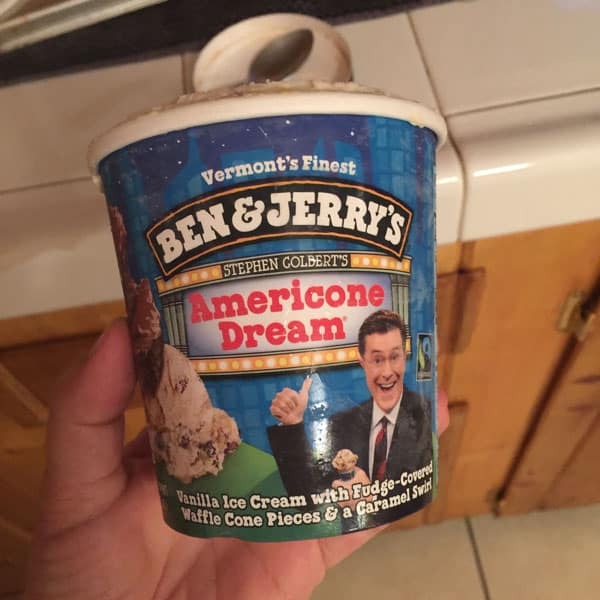 And much to Tim’s delight, the local grocery store had plenty of Ben and Jerry’s flavors to choose from. 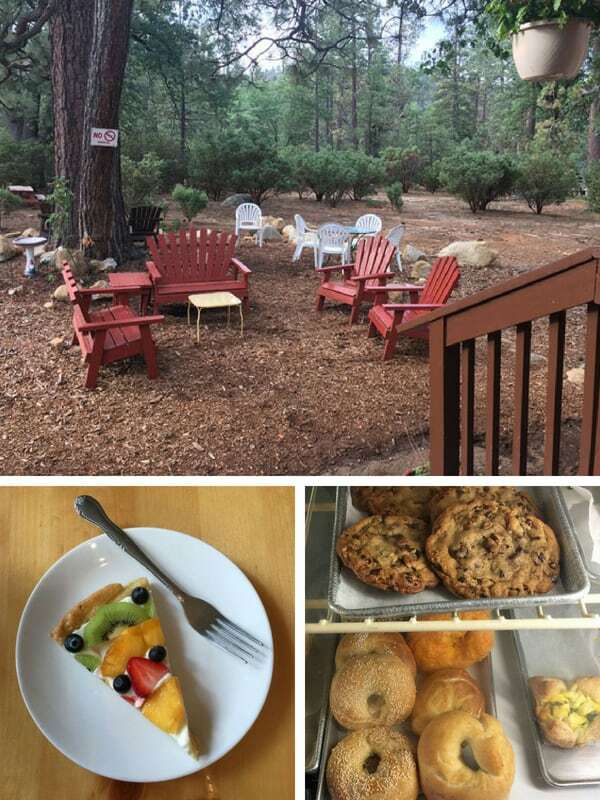 If you’re staying somewhere without a kitchen or don’t feel like cooking, Idyllwild has a variety of restaurants. They range from casual diner fare to fine dining and everything in between. We’re not big travelers but I do know that if you want good food, always ask the locals where to eat! During our hike, we chatted up a friendly woman who was walking her dogs. She was a fan of Ferro (a gourmet Italian Restaurant) but her highest praise was for Plant Food Supper Club, an entirely vegan restaurant. 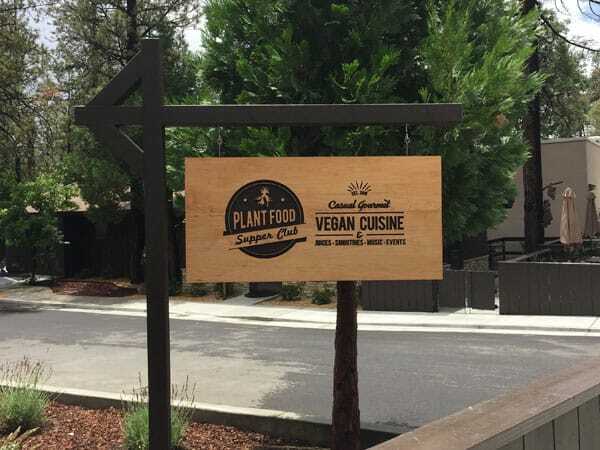 Seriously, I can’t say enough good things about the Plant Food Supper Club. Everything on the menu sounded yummy and fresh. 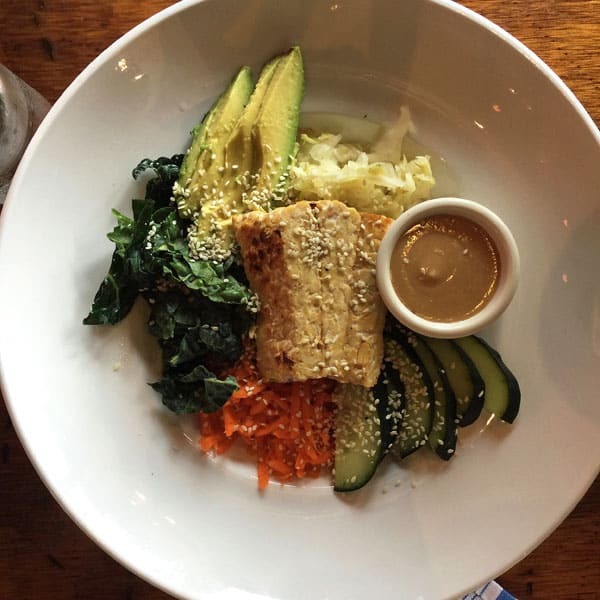 Eventually, I settled on a Macro Bowl with tempeh, quinoa, and a sesame miso dressing. Since I was soaking wet after the hike I ordered a bowl of their red lentil soup too. 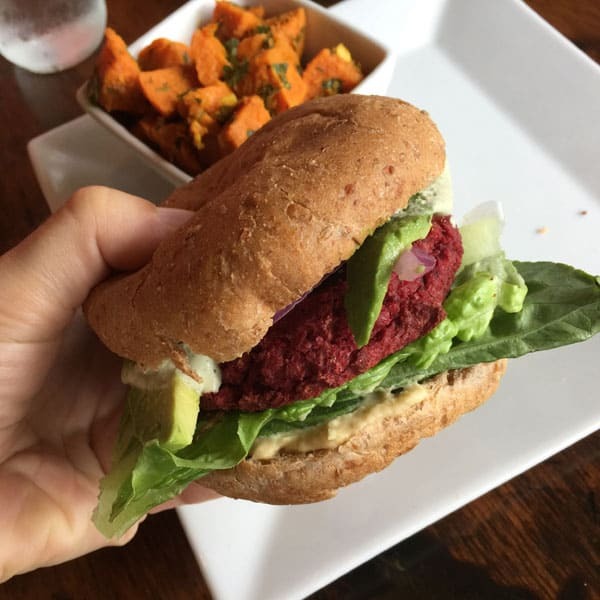 Tim got a hearty Beet Burger with a side of Moroccan Sweet Potato Salad. ALL of the food was delicious! We actually stopped by again the next day for a vegan goat cheese turnover and ginger molasses cookies. Which we promptly ate before I could take a picture. 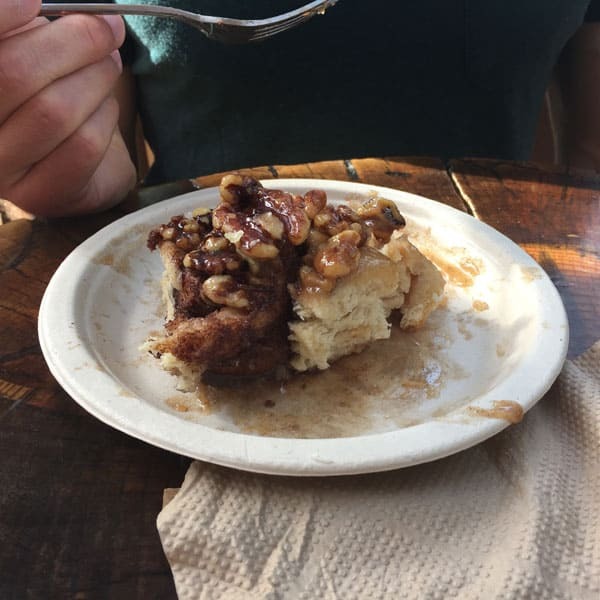 There are multiple candy shops and an ice cream shop in Idyllwild but our favorite sweets were definitely the pastries from the town’s two main bakeries. 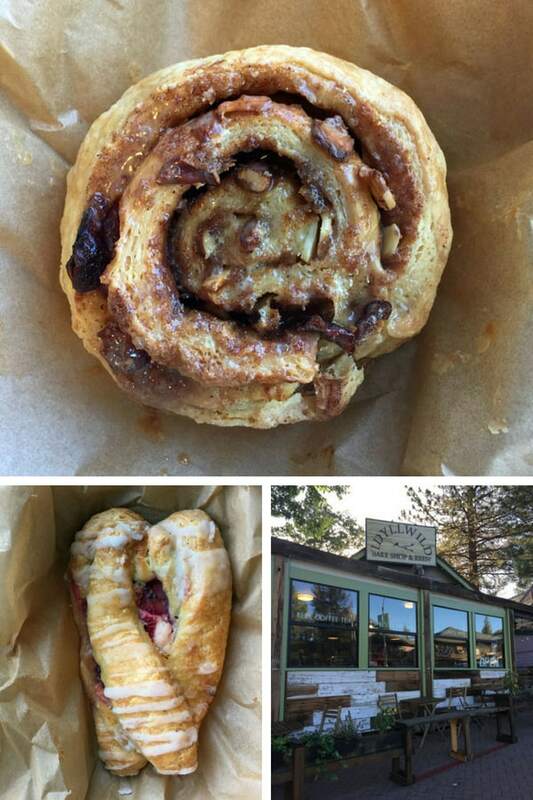 Idyllwild Bake Shop and Brew serves pastries baked fresh daily. On our first morning in town, we shared a Caramel Harvest Roll and Strawberry Dragonfruit Danish. 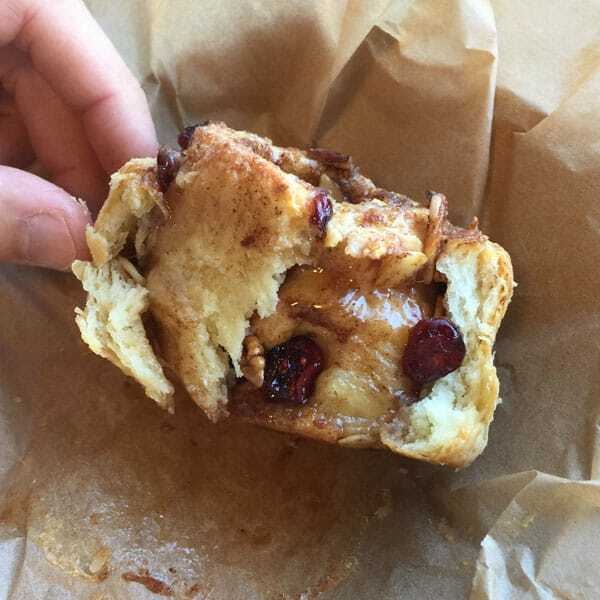 Both were buttery and delicious but the roll (filled with apples and dried cranberries) was absolutely amazing – I’d say it’s almost worth the drive up the mountain just to have one. They also sell day-old discounted treats that are perfect for tucking in your backpack. Tim snagged a day-old Bear Claw that he reheated in the toaster oven for a late afternoon snack. 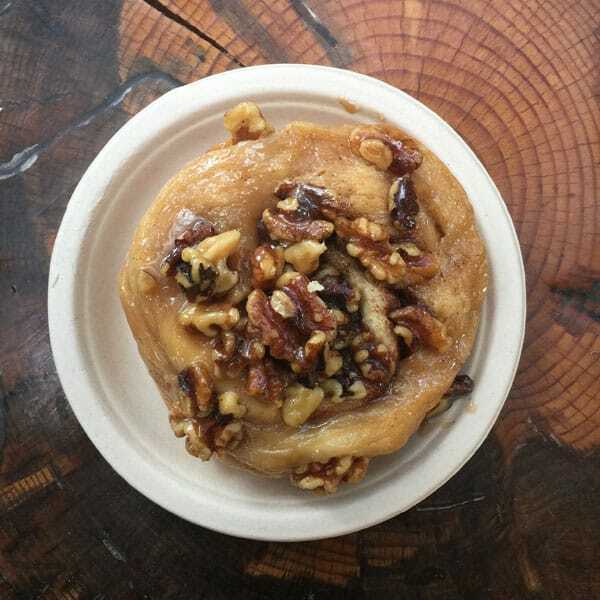 Town Baker Cafe also sells fresh baked goods, including bagels and giant sticky buns. They definitely win the award for best ambiance with an awesome back patio and outdoor space. Also, they have some gluten-free options (like fruit tarts) if that’s a concern for you. 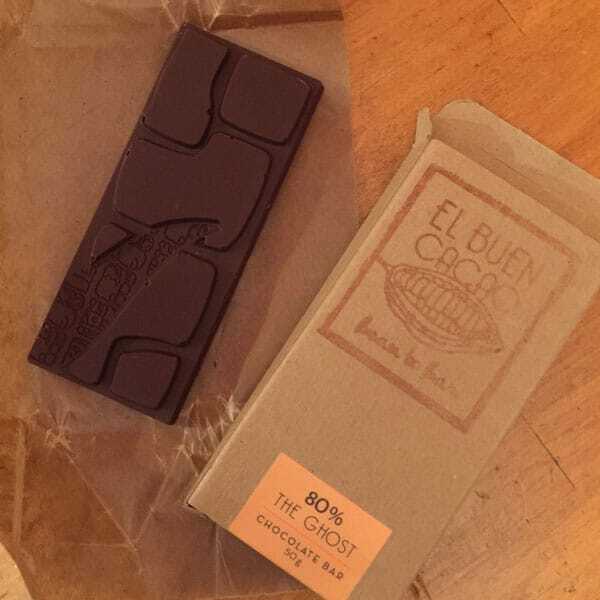 Then you’ll want to check out El Buen Cacao. It’s a tiny bean-to-bar chocolate shop run by a friendly young couple (and their adorable daughter). The chocolate is rich, dark, and delicious. 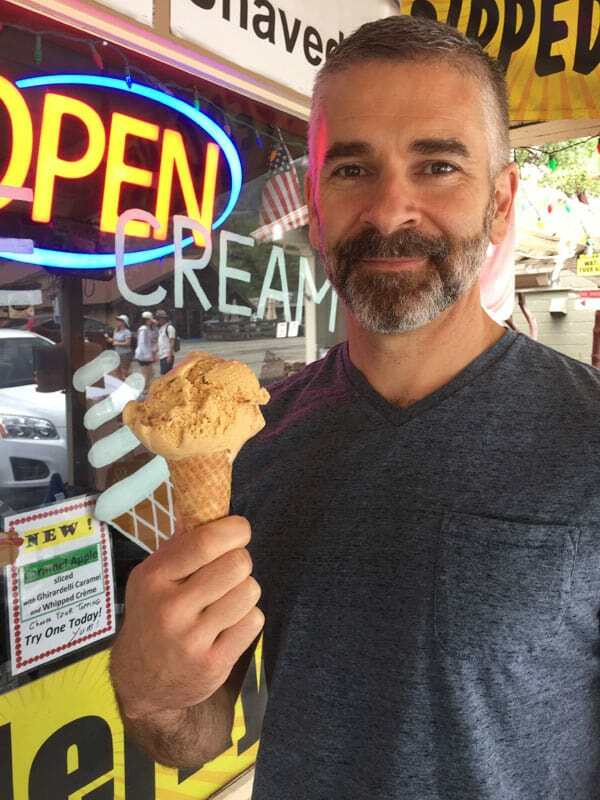 Being a lover of fiery foods, Tim bought a Ghost Bar (it’s made with ghost pepper chili and was wicked spicy!) but they have regular flavors too like Sea Salt and Raspberry. #1 – It’s over the top dog-friendly! 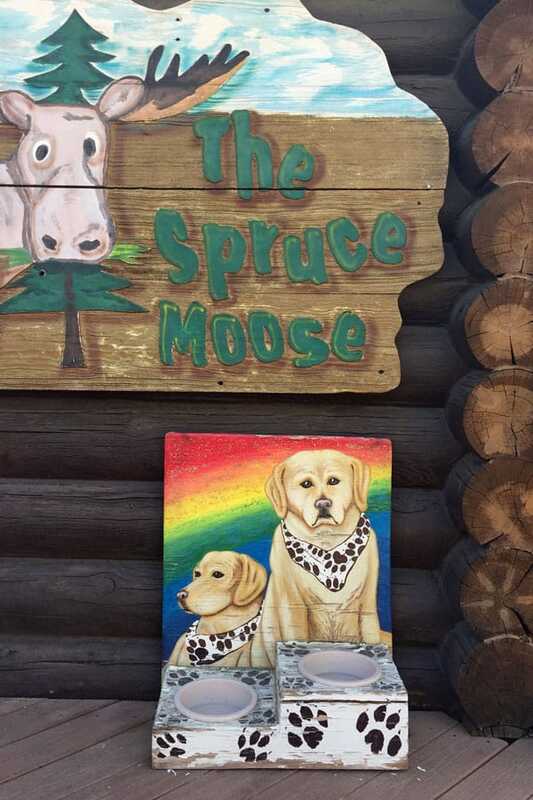 I wish we had known about this place while our dogs were still with us, they would have loved it. #2 – If shopping is one of your favorite activities, you won’t be disappointed. From a specialty jam & jerky shop to a tea store with hundreds of loose teas, there’s a little something for everyone. One thing to note: most of the shops close around 4:00 p.m. (at least on weekdays) and some of them are only open on weekends and select weekdays. #3 – This old YouTube video of a local news profile is what convinced us to visit this fun, friendly and peaceful mountain town. 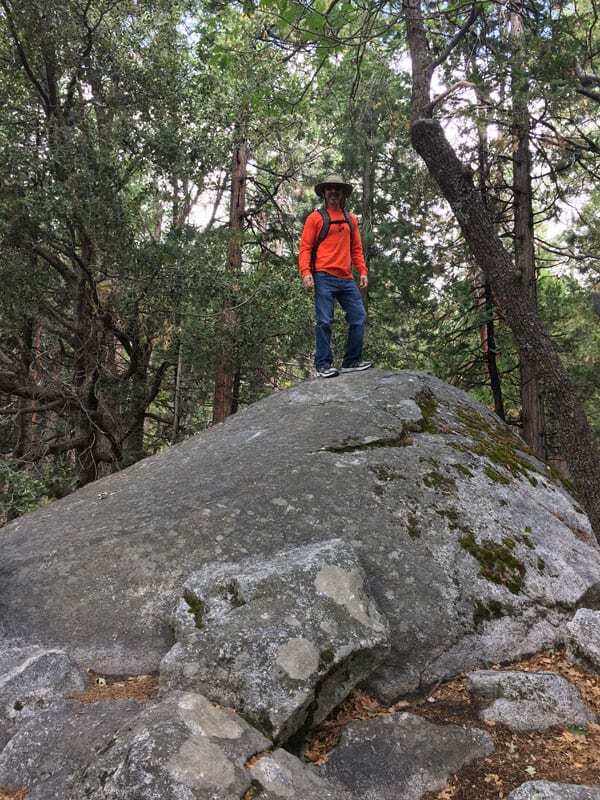 Well, that pretty much sums up our first (but certainly not last) trip to Idyllwild, California. 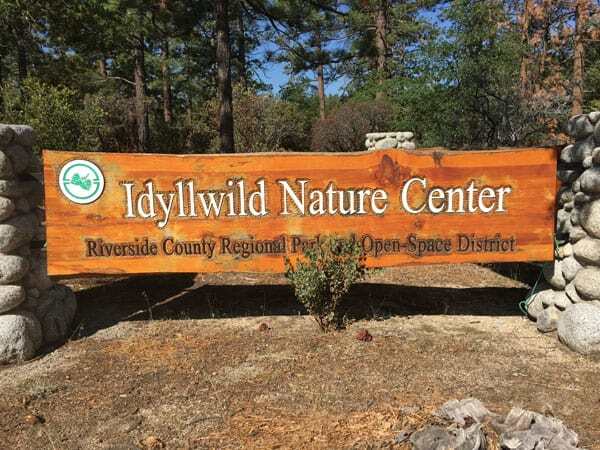 Have you been to Idyllwild before? Where did you eat, stay, explore – tell us what we missed!